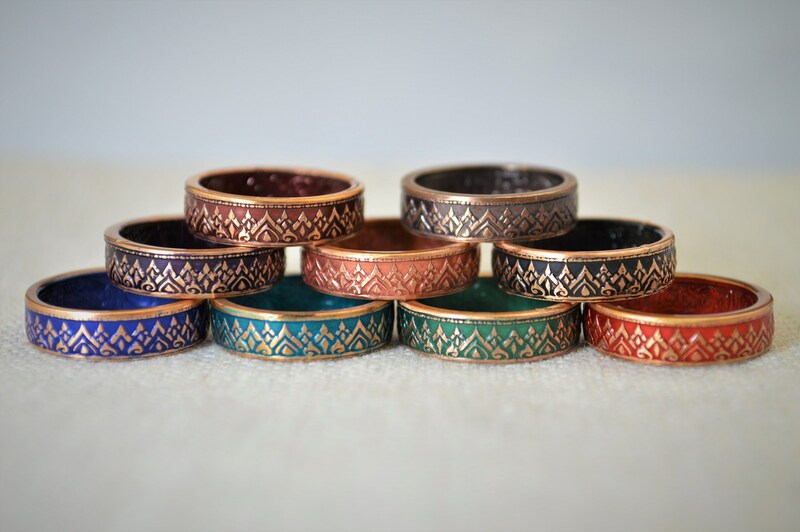 These rings are handcrafted using a bronze Kingdom of Thailand One Satang Coin. 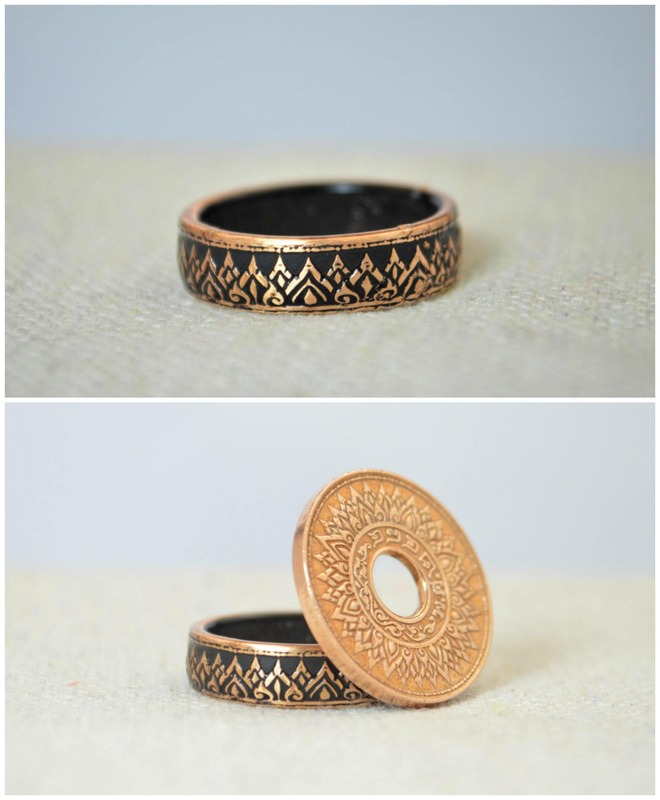 This design was Issued in bronze only in 1941 they feature a beautiful sun ray, or temple design that will be on the outside of the ring. The inside of the ring has the lettering: ๑ สต. รัฐบาลไทย which translates as 1st Thai Government. You can see the coin these are made from in the first photo. Each ring has a Black nanoceramic coating applied to the inside and outside of the ring. I then remove a portion of the coating from the outside to highlight the beauty of the coin. Finally I coat the ring in a clear ceramic. 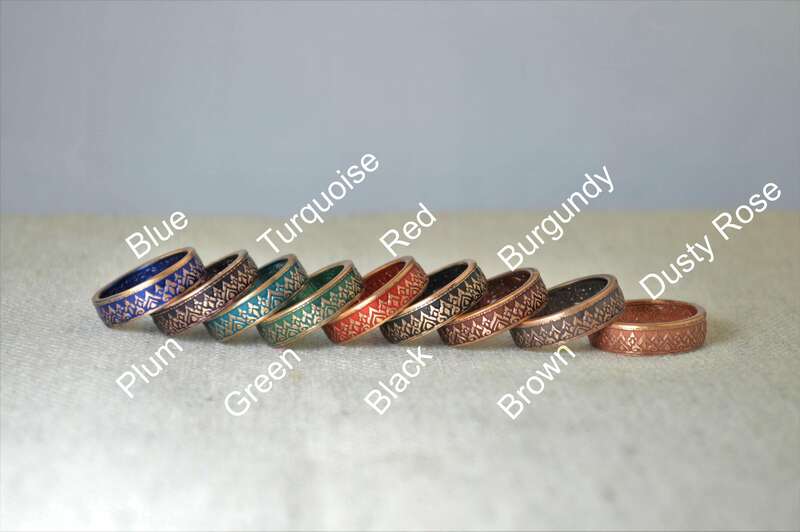 Bronze has enough copper in it that untreated metal can be reactive to skin, so I have chosen to apply the nano ceramic on the ring in a way that will prevent the the possibility of harmless "green finger". The nanoceramic will wear off over time, however I offer free replating of the ring as needed just pay postage. • Each coin is made of Bronze. Perfection! 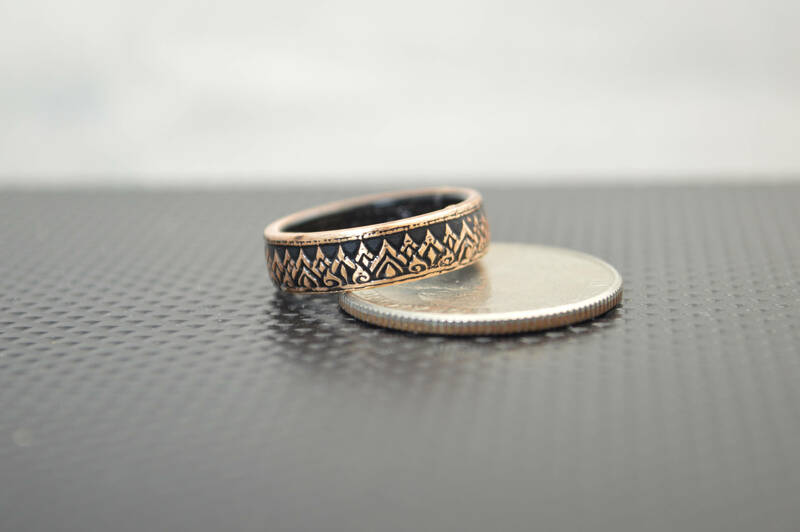 Ordered these for wedding bands for my fiance and myself, and have fallen in love. They have just enough weight to them, and the detail is wonderful. Special props to Michael and his team for going above and beyond! I'm very pleased with the ring and it arrived beautifully packaged. This ring has amazing detail and craftsmanship. I love it and will definitely buy others. The presentation and customer service were top-notch as well.